Our broad line of specialized trucker and RV antennas covers all your truck, RVs, SUVs, and emergency vehicles needs. Given the vehicle size and nature of travel, trucker and RV antennas are highly specialized and extra durable. As in any complete booster system, an exterior antenna is required to communicate back and forth with the closest cellular tower. 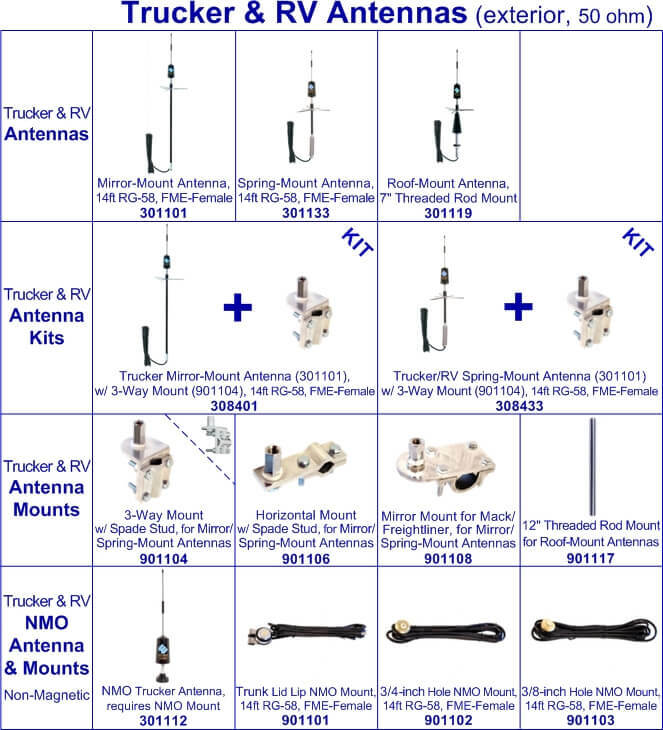 Trucker antennas are organized by mounting type: mirror-mounted and spring-mounted attaching to tubular mirror brackets on large truck, roof-mounted securing to roof surfaces of trucks or RVs, and NMO (non-magnetic option) connecting to your vehicle roof via a separate NMO mount. The 301101 is the mirror-mount antennas and the 301133 is the spring-mount antenna (both requiring a separate mounts). The 301101 is designed for commercial trailer trucks (18-wheelers) to extend above the trailer height while the 301133 is intended for trucks, RVs, and off-road vehicles. The 301101 mirror-mount antenna includes a 19-inch fiberglass and a 10-foot RG-58 coaxial cable with FME connector so it directly plugs into all vehicle FME amplifiers. The 301133 spring-mount antenna includes a built-in spring in its base to for added vibration resistance and durability. This antenna includes a 13.5-foot RG-58 coaxial cable with FME connector. These antennas require specific mounts but are also available in kits. These antennas attach to their mounts using standard CB 3/8 inch x 24 thread. There are three mounting options which include the Wilson 901104 3-way vertical mount with spade stud, the Wilson 901106 horizontal mount with spade stud and the Wilson 901108 mount for freightliners and Mack trucks. The first designed for vertical installations, the second for horizontal installations and the third designed specifically for freightliners or Mack trucks. The 301101 and 301133 are both available in kits which include the 3-way vertical mount. The 301101 and 301133 are both available in kits which include the 3-way vertical mount (Wilson 308401 and Wilson 308433 respectively). The 301119 is a roof-mounted antenna designed to be mounted onto the roof of a vehicle. This antenna requires drilling a 5/8 inch hole onto a roof and a 7 inch threaded mounting rod designed to span the difference between the roof and headliner. Available is also a 12 inch mounting rod which is the Wilson 901117 for trucks which require a longer rod. This antenna is mostly designed to pick up cellular signal from the majority of North American networks (it is strongest in gaining signal from the 850MHz and 1900MHz frequencies). It includes a 13.5 foot RG58 coaxial cable with an FME connector so is designed to be used with an amplifier that utilizes FME connectors. The 301112 is an NMO trucker antenna which requires a NMO mount (sold separately). This antenna is designed mostly for emergency response vehicles such as police trucks, fire trucks and ambulances. The mount required for this antenna is available in three varieties, all of which basically permanent options when it comes to trucks. Two of which require a drilling a hole and the other which requires a trunk making it an option which is not ideal for the majority of trucks. To be mounted, this antenna requires a metal ground plane so mounting on top of a vehicle (for the ones which require drilling a hole) is recommended. These three mounts include the Wilson 901103 3/8 inch NMO mount, the Wilson 901102 3/4 inch NMO mount and the Wilson 901101 Trunk NMO mount. The first requires a 3/8” hole while the second requires a 3/4 inch hole with the third requiring to be mounted near a trunk lip. All of these mounts include a 14 foot RG58 coaxial cable with FME connectors so to be used with an amplifier that requires a different connector, a converter is required. This stainless steel antenna boasts a 13.25 inch whip allowing for a high signal gain. 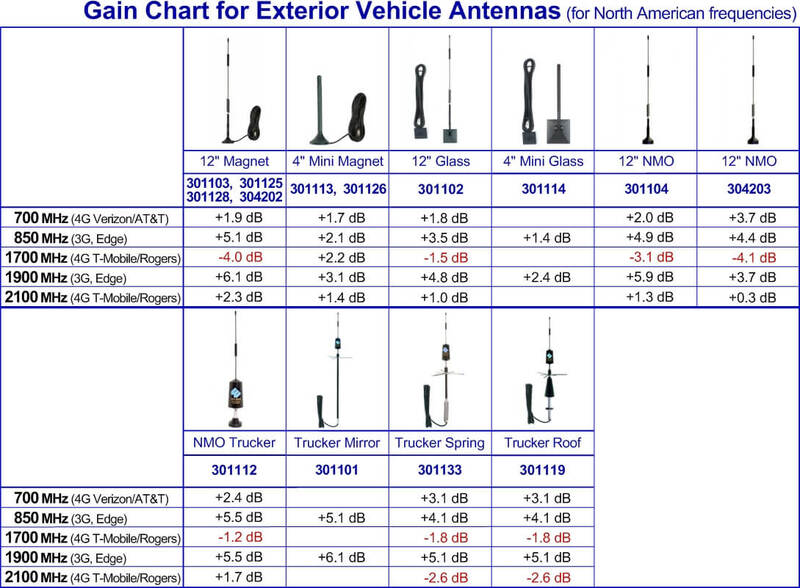 The following chart lists signal gains (in dB) for trucker/RV antennas. All trucker/RV antennas will work well on most North American frequencies, including the common 850/1900 MHz.